Imbalanced gut microbiota may be one of the underlying causes of type 2 diabetes, and changing this environment may help improve symptoms. Recently, a team of scientists examined the effects of beneficial, probiotic bacteria on blood sugar control in type 2 diabetics. Here is a detailed summary of their findings, published in Clinical Nutrition. Type 2 diabetes has been associated with dysbiosis — an imbalance in the bacterial community in the gut. Two studies even suggest that high numbers of undesirable gut bacteria may play a direct role in the development of type 2 diabetes. Supplementing regularly with probiotics may help change the gut environment. In diabetics, Lactobacillus probiotics may have beneficial effects on blood sugar control and blood lipids. A group of scientists from Brazil looked at the effects of probiotic supplementation on several markers of diabetes. This was a 6-week, randomized controlled trial examining the effects of probiotics on blood sugar control, blood lipids and inflammatory markers. Probiotic group: Participants in this group consumed 120 grams of fermented goat’s milk every day for 6 weeks. The milk contained two kinds of probiotics,Lactobacillus acidophilus and Bifidobacterium animalis. Control group: Participants in this group consumed 120 grams of conventional, fermented goat’s milk per day. It contained the probiotic Streptococcus thermophilus. At the beginning and the end of the study, the researchers measured blood sugar markers, insulin, blood lipids and inflammatory markers. Bottom Line: This was a 6-week, randomized controlled trial examining the effects of probiotics on blood sugar control, blood lipids, inflammation and other health factors in people with type 2 diabetes. HbA1c is short for glycated hemoglobin. It forms when hemoglobin, the protein that carries oxygen throughout the body, joins with sugar (glucose). Your HbA1c levels indicate how high your blood sugar levels have been in the past weeks or months, on average. Like HbA1c, fructosamine is a glycated protein that reflects blood sugar levels in the previous 2 or 3 weeks. 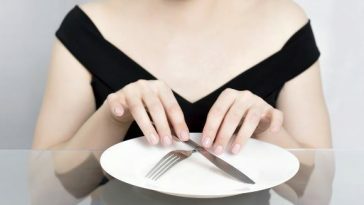 Conversely, fasting levels of blood sugar, insulin or insulin resistance did not change in either group. Taken together, these findings suggest that probiotics may improve blood sugar control in type 2 diabetics. This is supported by previous studies showing that eating yogurt containingLactobacillus acidophilus for 6–8 weeks may reduce blood sugar and HbA1c in diabetic individuals. Bottom Line: Drinking goat’s milk containing Lactobacillus acidophilus andBifidobacterium animalis appeared to improve fructosamine and HbA1c levels, compared to goat’s milk containing Streptococcus thermophilus. There was a significant difference in the changes in total cholesterol and LDL-cholesterol between groups, as seen in the chart below. 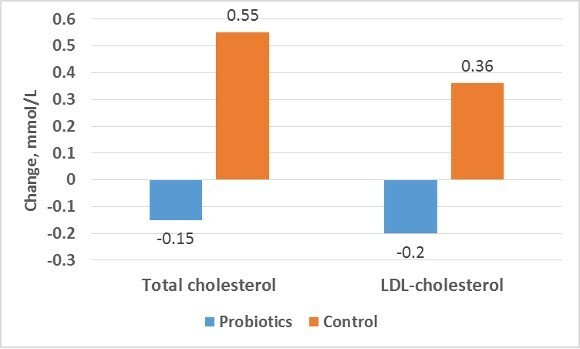 Levels of total cholesterol and LDL-cholesterol increased significantly in the control group, but went down slightly in the probiotics group. HDL-cholesterol and triglycerides did not change in either group. Previous studies have also shown that Lactobacillus acidophilus may reduce total cholesterol and LDL-cholesterol in type 2 diabetics. 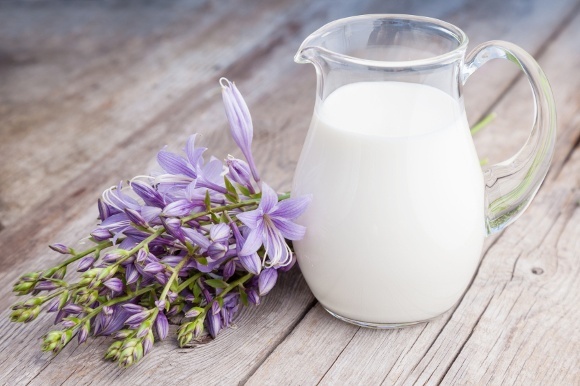 Bottom Line: Drinking milk containing Lactobacillus acidophilus andBifidobacterium animalis promoted a better blood lipid profile, compared to milk that contained Streptococcus thermophilus. Systemic inflammation may be an underlying factor in the development of type 2 diabetes. 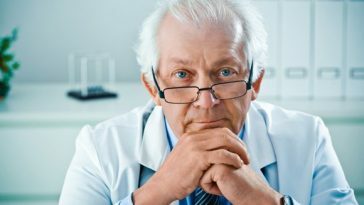 Therefore, the researchers measured levels of several inflammatory markers, including tumor necrosis factor alpha (TNF-α) and resistin. TNF-α and resistin decreased significantly in both groups over the course of the study. For this reason, the researchers concluded that drinking fermented goat’s milk may improve inflammation. Bottom Line: Drinking fermented goat’s milk that contained probiotics appeared to reduce inflammation. This happened in both groups. This study had several shortfalls. First, levels of HbA1c were significantly higher in the probiotic group at the beginning of the study. This might have affected the decrease in HbA1c in the probiotic group. Second, the control group got fermented milk that contained the probiotic bacteriaStreptococcus thermophilus, which may have health benefits different from those ofLactobacillus acidophilus and Bifidobacterium animalis. 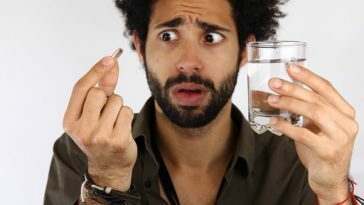 In a controlled trial, the experimental and control groups must not differ from each other except through the variables that are to be tested, which in this case are the probiotic effects of L. acidophilus and B. animalis. For this reason, the study may not have had a true control group. Bottom Line: The study’s design is questionable and it had a few limitations that make its results difficult to interpret. 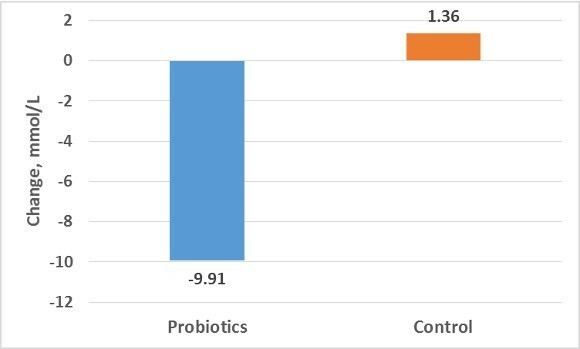 In short, the study suggests that the probiotics Lactobacillus acidophilus andBifidobacterium animalis may have health benefits in people with type 2 diabetes, compared to Streptococcus thermophilus. They improved the blood lipid profile and appeared to have beneficial effects on blood sugar control. This study adds to the growing evidence that probiotic bacteria can have wide-ranging health benefits.